2012 Gibson SGJ Trans White left handed guitar from Jerry’s Lefty Guitars in Sarasota, Florida. Phone 941 504 2634. See us at jerrysleftyguitars.com. The worlds finest left handed guitars, mandolins, ukuleles, and basses. 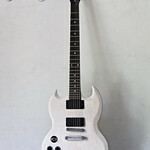 2012 Gibson SGJ Trans White left handed guitar.